This article is devoted for those people who are keen on hiking, camping, going to long journeys and doing other activities that require time and serious preparation. In this article we gonna speak about durable coolers with long ice retention period, about coolers that are able to withstand all extreme journeys and negative weather conditions. These coolers are not designed for everyday using, so if you need lunchbox or something like this, it will be better for you to read one of our other articles. If you are a real outdoorsman, then definitely you have heard about such coolers manufacturers as Pelican coolers and Yeti or Orca coolers. All these coolers are high-end and have the highest qualitative characteristics. Because of these facts they have achieved the title of the best coolers existed nowadays. It is rather predictable fact that the price of these coolers is high because of world popularity during many years. 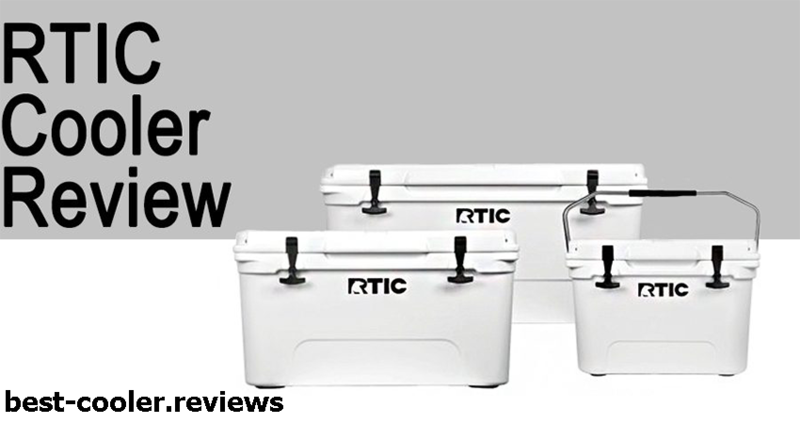 In this article we will try to compare famous Yeti coolers with RTIC lineup that has similar high—end characteristics but differs GREATLY in price. Thus, welcome to our battle! All You Should Know About RTIC Coolers. In this part of our article we will tell you everything that you should need about RTIC coolers. You will know all pros and cons of this brand and also we will tell you some their…secrets. What will I Get After Ordering? So, you have decided to purchase RTIC cooler and made your order. Let’s clarify what you will get after shipping process. 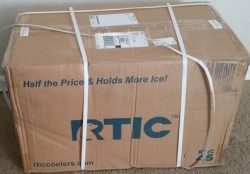 Each RTIC cooler is wrapped in a special durable plastic bag in order to prevent damages and scratches that may occur while shipping. 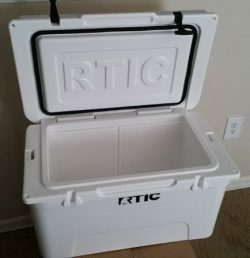 RTIC coolers are delivered with feet, rope handles and T latches, so the conclusion can be made that you can use your cooler immediately after shipping. No extra wrapping material, no advertising papers, only your cooler. Perfectly. Secrets of RTIC Coolers Construction. The main secret of high performance and quality of RTIC coolers is their Roto Molding structure. Rotationally molded coolers can withstand any weather conditions and will provide you with the longest ice retention terms. The meaning of the rotationally molding technology is that cooler’s walls, bottom and lid have equal thickness. With such molding method each cooler is one – peace cut that significantly increases insulation level and durability. Such technology is must-have feature, if we speak about high-end coolers. Thus you will receive durable cooler that is ready to extreme weather conditions and that can provide you with REALLY long ice retention period, so you can go to long trip without fears that you will find you food and drinks floating in the water because of melted ice. RTIC manufacturers created a variety of sizes to choose from, so you can choose the size you need for large company or for couple of your friend and you. Gatherings, camping, fishing or hunting – each activity will be amazing with such cooler that can provide you with permanently cold beverages and food. A Little Bit about RTIC Coolers Insulation. One more secret of RTIC high efficiency is its insulation. The high insulation level is caused by technology of rotationally molding about which we have written above. With the thick two-inch layer of polyurethane foam in RTIC cooler walls (some options have even three-inch thickness) you will be provided with the highest level of insulation that is available nowadays. Thanks to such good insulation RTIC coolers are able to hold an ice up to ten days according to the information provided on the official website. Choosing the appropriate size among available RTIC coolers will not be a problem thanks to the wide choice of sizes available. Let’s consider them from the biggest to the smallest one. Being perfect cooler for the large company, this option is the largest in the RTIC coolers lineup. Rather unexpectedly, but this cooler can be carried and handled by only one person. Although we think that it will be much safer and more convenient to transport these 36.5 pounds by two people. But it’s up to you. With the dimensions of 30 5/8” x 15 ½” on cooler’s bottom side and 32 ¼” x 18 ½” on cooler’s top side this RTIC giant can accommodate nearly 70 pounds of ice and up to 64 cans. With such tremendous capacity it will be the perfect option for great parties and long trips with large group of people. This is the middle-sized cooler in the RTIC lineup. This cooler can be called ‘the golden middle’ because size of 25 ¼” x 13 ¾” on the cooler’s bottom side and 26 ½” x 16 ½” on the cooler’s top side together with weight of 25 pounds is very convenient for many purposes. You can take such cooler to fishing or hunting as well as it will fit perfectly to camping or parties. You can put up to 36 cans inside this cooler that will be fully enough for you and some of your friends. Convenient, not bulky, not heavy, spaciousness option for different purposes. You can also choose this option in different colors. 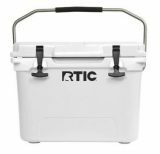 The smallest cooler in the RTIC lineup is the RTIC 20. Great option for one person or for couple of friends in a short journey or at the picnic. With the measures of only ¾” x 11 ¼” on the cooler’s bottom side and 20” x 13 ¾” on the cooler’s top side it is the most convenient option to transport. You can easily carry it in hands or put it on the backseat of your car where it will not take much space. You can put up to 24 cans together with 25 pounds of ice in this cooler. With the weight of 17.5 pounds you will easily manage with it by yourself even when fill it completely. Small, convenient and effective. All that you need for short trip or picnic outdoors. You can choose this option in different colors. In fact, all RTIC coolers are available to purchasing in three modern colors. You can choose it in Ocean Blue, Arctic Wave and Mojave Tan color. Main Features of RTIC Coolers. RTIC coolers have achieved their popularity thanks to the number of features. In this paragraph we will consider them all starting from coolers bottom to its top. RTIC cooler’s feet are specially designed to keep it off the hot surfaces and of the ground in general, thereby increasing its ability to hold an ice inside as long as it is possible. Because of these feet cooler can hold cold inside even standing under the scorching sun. The most unpleasant but unavoidable procedure while using cooler is its cleaning and draining. Specially designed draining system of RTIC coolers has turned this procedure into pleasant pastime. With V drain you will be able to drain water and clean your cooler very quickly and without significant efforts. No more incorrect draining and sufferings after using. Quick and simple procedure. One more useful feature of RTIC coolers is their compatibility with the dry ice. You can use them with or without dry ice, it’s up to you, but the fact that they are compatible with dry ice will never be excess. In addition to this in one of the previous articles we have included RTIC coolers into the list of best dry ice coolers. We have already talked about insulation but we remind you a little bit. With the 2” or 3” thickness walls RTIC coolers will provide you with more than ten days of ice retention. Great term for coolers, isn’t it? Thanks to the non-slip lid you can stand, sit and even jump on the lid of your cooler if you need it. Specially designed durable locking system will provide you with additional security level, so you can be sure that the content of your cooler will be safe and sound. Thanks to the hinge system of the RTIC coolers the lid of the cooler will not be separated from the cooler’s body. Such system is strong and durable. Hinge system is an integral part of long trips with coolers. Even the biggest cooler in RTIC lineup can be carried by one person. Manufacturers of this brand created coolers with two types of handles available. One type of them is rope handles and other type is molded into the cooler’s body. Depending on the weight of your cooer you may use whether first type or second for the maximally convenient transportation. 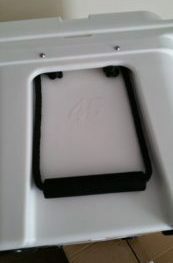 In order to stabilize cooler and prevent bouncing when driving or being on the water the manufacturers have developed molded tie down slots. Thanks to such sections on the sides of the cooler’s body you will be able to attach your cooler to the boat or truck for convenient and secure transportation. What’s the use of your cooler if it can’t lock the cold inside and keep the hot air outside it? To maximize the efficiency of the cooler there is a freezer grade gasket around the lid of the cooler. The dimensions of this gasket are ¼ inch wide and ¼ inch thick that will help your cooler to securely lock cold inside for long time periods. Specially developed T Latches lock will save you from problems connected with the inconvenient locks. To maximize the effectiveness of the cooler, RTIC latches with “T” design are very convenient and simple in using and can withstand all weather conditions. Latches allow you to easily open your cooler when you need it and at the same time securely lock it when you want it to be closed. In this way cooler’s content is in safety and hot air can’t get into the cooler. RTIC coolers are one of the leading brands nowadays, so it is not a surprise that as other high-end options RTIC coolers are bear resistant and are included into the list of “bear proof coolers”. Your cooler will be completely protected from animals’ intervention and its content will not be damaged even if you are going to make next trip into the wild. Rotationally molding technology will make your cooler completely secure. For What Purposes are the RTIC Coolers Developed? The RTIC 65 despite its large size can be carried by one person as it was mentioned above. This cooler will suit long trips, hunting (both good for small and rather large game) or camping. Our team has decided to give it a title of ‘the best marine cooler’, but of course you can use this cooler for other purposes too, it will perfectly cope with its tasks. The RTIC 45 is a middle-sixed cooler, so, frankly speaking, it will fit any purposes you want. This option will be good for fishing trips, camping, and hunting (will be good for small game), or for parties as well. This cooler can be easily carried by one person, so you can take it wherever you want. The RTIC 20 is the smallest and the most compact cooler in this lineup. Our team has decided to give it a title of ‘the best personal cooler’. This cooler will be good for taking to the work or to the picnic at weekends. You can also take this cooler while camping if you like camping by yourself or with a friend. To prove all listed above we decided to present you some users’ reviews that can tell you about REAL features of RTIC coolers in a REAL life. In one of the reviews user said that he was completely satisfied with the quality of his new cooler. He said that its construction is very durable and the ice retention period lasted fourteen days. Also uses added that he used his RTIC cooler to stand on it and it was easy and safely thanks to the cooler’s non-slip lid. Another user wrote that his cooler was well-built and pleased him with ice retention term. The one disadvantage that this user found was the duration of the manufacturer’s warranty. User claimed that for such high price the warranty should be much longer than only thirty days. He said that even if he never use this warranty, it is ridiculous that other options on the market, which price is significantly cheaper, have much longer warranty term. Time for Battle! 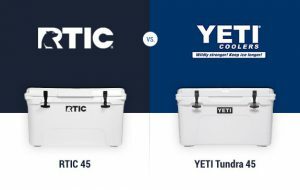 RTIC vs. Yeti Coolers. Ready to Know the Winner? We have slowly got to the most exciting part of our article. In this paragraph we will compare two world leading brands with similar characteristics and decide who is worth the title of WINNER. So, let’s get the RTIC vs Yeti battle started! We have taken this information from the manufacturer’s website in order to show you the real free space inside each RTIC and Yeti coolers. 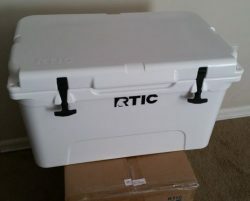 Yeti Tundra 65 is able to hold 56 pounds of ice and 39 cans, while in the RTIC 65 you can put 70 pounds of ice and 64 cans. Yeti Tundra 45 is able to hold 35 pounds of ice and 26 cans, while in the RTIC 45 you can put 40 pounds of ice and 36 cans. Yeti Roadie 20 is able to hold 20 pounds of ice and 14 cans, while in the RTIC 20 you can put 25 pounds of ice and 24 cans. Terms of Ice Retention of Yeti vs RTIC Coolers. Speaking about ice retention of Yeti and RTIC coolers we want you to know that in this case any specific numbers can’t be presented. Duration of ice retention depends greatly on the conditions. On the weather conditions and conditions of using too. It is senseless to compare duration of ice retention of cooler that was standing the whole day under the sunrays and cooler that was for example at the backseat of your car. Also the great importance has the frequency of opening the cooler. Of course cooler that was opened once a day will hold an ice much longer than cooler that was opened once per several hours. Because of these facts Yeti manufacturers don’t write about ice retention terms on the official Yeti website. They say that there are many circumstances that can influence on duration of ice retention term and change it significantly. However RTIC manufacturers write on their website that RTIC coolers can hold an ice during ten days, although users state that this term can be prolonged to the fourteen days and even more while using cooler properly. Thus, we can’t say that RTIC or Yeti coolers are better because their ice retention is longer. Both these brands have good ice retention terms, but while choosing a cooler take into account that ice retention term offered by manufacturer can differ from real ice retention term because of all above listed reasons. As you have already noticed, both these coolers are very similar in their construction, design and features. Both Yeti and RTIC coolers have the highest quality. But we should determine the winner. First moment is brand. If you are keen on the world famous brands and can afford to pay extra money for it, than the Yeti line up will fit you most of all. Premium name, premium qualities, premium quality – all this you will get after purchasing Yeti cooler. Another moment is when you have a limited budget and all you need is pure quality without any loud brands and popularity. 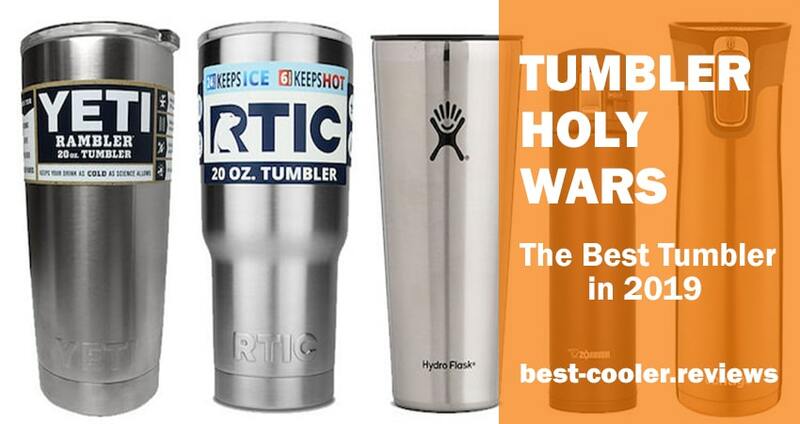 RTIC coolers are also popular all over the world but nevertheless they are not as famous as Yeti coolers are. For those users who need high quality features and don’t want to overpay for brand RTIC coolers will be a great finding. Affordable price together with the same quality and features as Yeti coolers have – all this you will have after purchasing RTIC cooler. It’s up to you what brand to choose and we all have different tastes and points of view, but in this article our team decided to make RTIC line of coolers a winner. No secrets, we have mad this decision because price. We think that if you need a qualitative cooler, it shouldn’t be important what brand is engraved on its walls. The most important thing is the cooler’s performance and functionality. Again, we will not persuade anyone to choose RTIC cooler instead of Yeti, we have only told you some facts that can be decisive while choosing a cooler. Where Can I Buy My RTIC? As manufacturers state on the official RTIC website you will not find their production at dealers or stores. As they are brand that is ‘direct-to-consumer’ it will be the simplest way to order your cooler directly from the official RTIC website. Despite this fact we want to tell you in secret that these coolers have been spotted on Amazon and before you decide to order them by the official dealer, we recommend you to try your luck and check out Amazon right here. You may think that it will be fully enough to purchase a new cooler, but in fact it will not be so. When you start using a cooler you understand that some additional accessories would not be redundant. Need some examples? Easy. Imagine that you go fishing and need a place where to put your catch. Of course you will put it in your cooler, but stop…in the cooler are your sandwiches and drinks. What you should do? Agree, that it will not be very good when your sandwich has a smell of fresh fish, won’t it? For such situations there are some dividers (here for RTIC 45 and here for RTIC 65) that will cope with this problem. You can also purchase additional plug for your cooler if you need it. As well as dividers and additional plugs it will be great to purchase a RTIC koozie in addition to your new RTIC cooler. 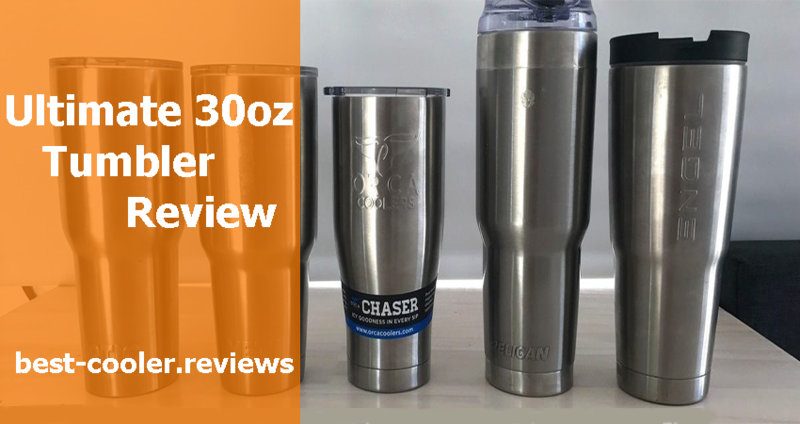 We have recently written about it in our RTIC koozie review where you can read about all advantages of this excellent addition. As well as RTIC accessories you can purchase many other accessories from other brands that will also fit your RTIC cooler. You can find them on Amazon. The conclusion of this detailed review will be short. All features, advantages and disadvantages we have already presented to you. 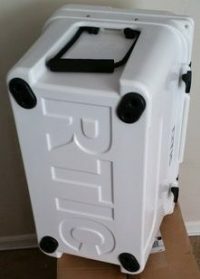 All that’s left to say is that if you are searching for qualitative, well-build, durable cooler with long ice retention terms and stylish design, then the RTIC coolers will be you final point of your search. With affordable price and high-end characteristics these coolers are better than many other similar coolers on the market. You definitely will not regret after purchasing these coolers. Premium Coolers on Sale! Don’t Miss Best Cooler Deals 2016. World Famous Premium Coolers at a CRAZY Discounts! We have found some high-end coolers at the incredibly low price. Hurry up and save hundreds of your dollars on the premium – class coolers. For more available coolers on sale go and check out this page on Amazon not to miss your perfect bargain. Everybody knows that the price of world famous Yeti coolers is far from the cheapest. With the Cyber Monday discounts today you are able to grab your new Yeti cooler with a great discount. We are ready to present you ice chests from Yeti manufacturer immediately after they got into list. SO, be on the alert and don’t miss it! For more options on sale you can check out this page on Amazon and choose your new cooler at a tempting price right now. Fishers and hunters can also get into play and watch coolers for fishing and hunting trip at very low prices. Make your next weekend unforgettable! Check out this page on Amazon and choose the best option for you. Looking for more soft coolers? Then check out this page on Amazon to find them. Backpack and soft coolers have not also stay aside. For the best available options at discounts you can check out this page on Amazon and choose the best one for you. If you gonna go camping at a next weekend or holiday, then you can’t do without camping coolers. You can find it here at very good prices, just follow this link and check out this page on Amazon.